Theo Wargo/Getty ImagesBeyoncé at the 2016CFDA Awards. 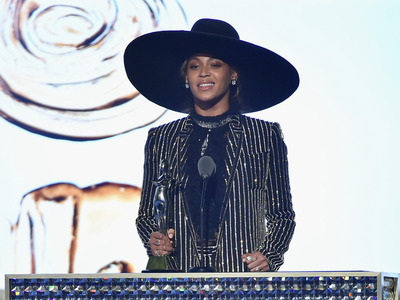 Beyoncé was awarded the Fashion Icon award at the 2016 CFDA Awards, which are pretty much the Oscars of the fashion world. The actress/singer/entrepreneur made a surprise appearance at the event to receive the award, and gave a heartfelt acceptance speech. In it, she spoke about the influence fashion has had on her life, dating back to when her grandmother picked up work as a seamstress so she could afford to send Beyoncé’s mother to Catholic school. Beyoncé also talked about her mother’s outsized impact on her career through fashion. After countless design houses refused to dress Destiny’s Child, “My mother and my Uncle Jonny designed all of our first costumes and made each piece by hand…individually sewing hundreds of crystals and pearls…putting so much passion and love into every small detail,” the singer said. And it wasn’t just those early outfits. “My mother designed my wedding dress, the dress I wore when I won my first Grammy,” Beyoncé said. Thank you Diane. It’s such an honour to receive this award from you. You know, as long as I can remember, fashion has been a part of my life. It’s effect on me actually started before I was born. My grandmother was a seamstress. My grandparents didn’t have much money and couldn’t afford my mother’s Catholic School. So my grandmother sewed clothes for the priests and nuns, and uniforms for the students, in exchange for my mother’s education. She then passed this gift down to my mother and taught her how to sew. When we were starting out in Destiny’s Child, high-end labels didn’t want to dress four black country girls. We couldn’t afford designer dresses. My mum was rejected from every showroom in New York. But like my grandmother, she used her talent and creativity to give her children their dreams. My mother and my Uncle Jonny designed all of our first costumes and made each piece by hand…individually sewing hundreds of crystals and pearls…putting so much passion and love into every small detail. And when I wore these clothes onstage, I felt like I had an extra suit of armour. It was so much deeper than any brand name…my mother and my uncle and my grandmother were with me…I couldn’t fail. This to me is the true power and potential of fashion. It’s a tool for finding your own identity, expression, and strength. It transcends style and is a time capsule of our greatest milestones. So to my mother, my uncle, and my Grandma, I just want to say thank you. Thank you for showing me that having a presence is more than the clothes you wear or your physical beauty. Thank you for showing me how to never take no for an answer. Thank you for showing me how to take risks, work hard, and live life on my own terms. And I want to say thank you to every designer that works tirelessly to make people feel like they can write their own story. You are fairy godmothers, magicians, sculptures…sometimes even therapists. I encourage you to not forget this power that you have or take it lightly. We have an opportunity to contribute to a society where any girl can look at a billboard or a magazine cover and see her reflection. Soul has no colour, no shape, no form…just like all of your work, it goes so far beyond what the eye can see. You have the power to change perception, to inspire and empower…to show people how to embrace their complications and flaws to see the true beauty and strength that’s inside all of us.